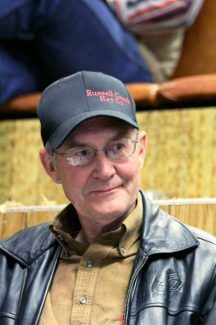 Jim McCabe, Ekalaka, Mont., purchased Iron Mountain Cattle Co. bulls. Lonnie Hall, Spearfish, S.D., visits with sale host, Dan Long after the Iron Mountain Cattle Co. bull sale. Repeat buyer, Fred Rittberger, Hermosa, S.D., at the Iron Mountain Cattle Co. sale. 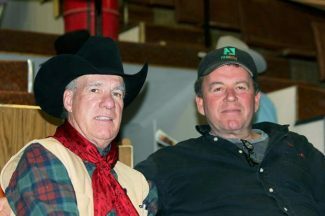 Iron Mountain Cattle Co., owned by Dan Long and managed by Mike and Kathy Davis, held their annual bull sale at the Belle Fourche Livestock Exchange on March 23, 2015. This was one of the best crowds that Iron Mountain Cattle Co. has had for their sale, and the best set of bulls they have offered to date. The Iron Mountain cowherd was built on a solid foundation of genetics from Schaff Angus Valley, Assman Land & Cattle and Sinclair Cattle Co. The bulls in this sale represent those genetics mated with the top herd bulls in the Angus breed. The bulls were loaded with muscle, thickness and calving ease. Plus the all-important carcass traits feeder cattle buyers are demanding. Topping the sale was lot 55, Iron MTN Consensus B171, a Mar. 2, 2014 son of Connealy Consensus 7229 that had a weaning wt. of 825 pounds to ratio at 124 and yearling wt. of 1,431 pounds, ratio 117. This bull posted epds of BW 1.8 WW 61 YW 105 Milk 31 and sold to Mickey Simon, White Owl, S.D., for $13,500. Lot 1, Iron MNT Resource B116, a Feb. 16, 2014 son of SAV Resource 1441 with epds of BW 2.9 WW 75 YW 124 Milk 28 sold to Mike Vaughn, Kyle, SD for $13,000. This bull had weaning and yearling ratios at 110. Selling at $10,500 was lot 5, Iron MNT Resource B179, a Mar. 4, 2014 son of SAV Resource 1441 with epds of BW 4.1 WW 59 YW 107 Milk 29. This bull sold to Dan & Joyce Tracy, Newcastle, Wyoming. Also selling at $10,500 was lot 14, Iron MTN Resource B151, a Feb. 22, 2014, son of SAV Resource with epds of BW 5.0 WW 68 YW 121 Milk 28. 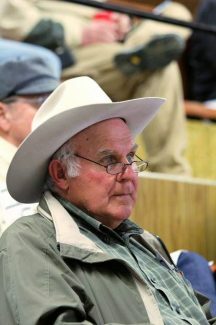 Fred Hoff Baker, Montana, was the buyer. Tracy's also purchased lot 37, Iron MTN Final Answer B027, a Feb. 4, 2014, son of SAV Final Answer 0035 with epds of BW 1.5 WW 52 YW 110 Milk 21 for $10,000. Another bull at $10,000 to Cody Moore, Kennebec, South Dakota, was lot 22, Iron MTN Bismarck B153, a Feb. 23, 2014 son of SAV Bismarck 5682 with epds of BW 1.3 WW 58 YW 96 Milk 23.